Indian Institute of Technology Madras is establishing a National Centre that will work to modernize India’s ports and fast track waterways. The National Technology Centre for Ports, Waterways and Coasts (NTCPWC) will be a strategic and innovation-oriented initiative tasked with bringing cutting-edge Technology to India's Ports, waterways and Maritime Sector. 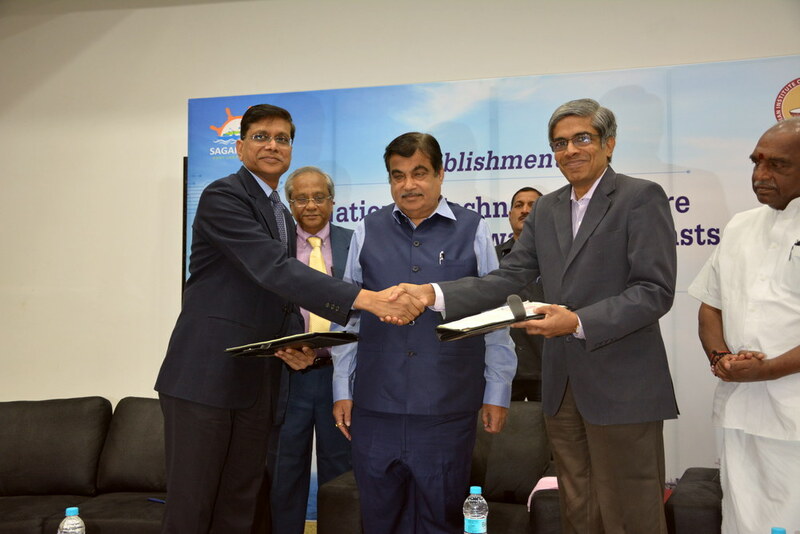 NTCPWC will be a centre for technological innovations and will function as the Technology Arm of Union Ministry of Shipping Shri Nitin Jairam Gadkari, Honourable Minister for Road Transport and Highways, Shipping and Water Resources, River Development and Ganga Rejuvenation, laid the Foundation Stone on 26th February 2018 for NTCPWC, which is being supported by Sagarmala Project, Government of India Shri Kailash K Aggarwal, Joint Secretary (Sagarmala), exchanged the MoA with Prof. Bhaskar Ramamurthi, Director, IIT Madras. Sagarmala is a strategic and customer-oriented initiative to modernize India’s ports so that port-led development can be augmented and coastlines can be developed to contribute to India's growth. The Nodal Officers for the NTCPWC will be Prof. V. Sundar and Prof. K. Murali, both from Ocean Engineering Department, IIT Madras. The NTCPWC will work as the Technology Arm of Ministry of Shipping providing the needful technological support to ports, Inland Waterways Authority of India (IWAI) and other institutions. It will focus on technological innovations and evolution of new ideas and breakthroughs for the port, waterways and maritime sector and provide effective solutions to an extensive range of problems being faced in the industry through scientific support and carry out education, applied research and technology transfer. 5. Attain self-sufficiency in providing short and long term solutions through scientific studies, Technology development, and Technical arm in identifying complex problems and solving issues.